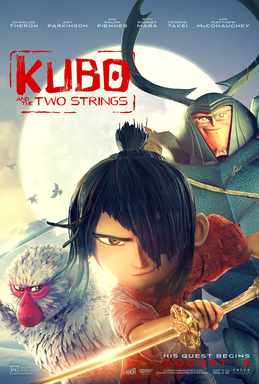 But anyway: Kubo and the Two Strings is the story of Kubo, a one-eyed young boy who cares for his mother in a cave atop a mountain next to a village. Every day, he goes down to the village to tell stories with the use of his shamisen that can magically manipulate origami- but his mother warns him not to stay out after dark or her Sisters and the Moon King, his grandfather will come to take his remaining eye. (They took his left one as a baby.) One day, Kubo learns of a festival with a ceremony where family members communicate with their deceased loved ones- he tries to speak to his father, Hanzo who is buried at the local cemetery but leaves when his father does not respond- but stays out after sundown. His mother arrives to fend off her sisters, but tells him to find his father's magic armor before sending him away and charging into one last battle to save him. When Kubo wakes up, he meets Monkey- the little wooden charm that his mother had given him who has come to life to serve as his protector. An origami version of his father, Hanzo helps to lead them to Beetle, who is a samurai who has been turned into a weird human/Beetle hybrid and knew Kubo's father who joins their quest to find the magic armor. First, they have to go to the Hall of Bones and find the 'sword unbreakable' which they do, defeating a giant skeleton in the process. Then, they sail across the Long Lake in an origami boat and dive to it's depths through the Garden of Eyes to get the 'breastplate impenetrable' (this is the part where Little Man made me stop the movie). After they cross the lake, the go to Hanzo's old fortress to find the Helmet- the last piece of the puzzle only to find that Kubo's aunts waiting- it's a trap. Beetle is killed and Monkey sacrifices herself to get Kubo away to safely and the origami Hanzo tells Kubo that the helmet is the bell in his old village and retrieving that, prepares for one final encounter with his grandfather, the Moon King. My general benchmark for kids films is a simple one: do they entertain me as much as they entertain my children? In the case of Kubo and the Two Strings that answer is a resounding 'yes' and it's helped by the fact that this is the most beautiful stop-motion animated film I think I've ever seen in my life. Gumby? Wallace and Gromit? Chicken Run? They've got nothing on Kubo... Kubo takes the medium to an entirely new level and were it not for strong competition from Zootopia and Moana for the Best Animated Oscar (both Zootopia and Moana are amazing films in their own right- this was a very good year for animated films) Kubo would have been, in my mind, a total shoe in for the top prize.